Chattanooga, Tenn. (Jan. 5, 2016) – The Chattanooga Marathon Planning Committee (CMPC) is excited to announce two great community partnerships for the inaugural 2016 Chattanooga Marathon – Erlanger Health System has signed on as the Title Sponsor and BlueCross BlueShield of Tennessee as the Presenting Sponsor. The official name of the event is the Erlanger Chattanooga Marathon presented by BlueCross BlueShield of Tennessee. The Erlanger Chattanooga Marathon presented by BlueCross BlueShield of Tennessee will be held March 4-6, 2016, and will include an Expo, Kids Fun Run, 5K, Team Relay, and a Half and Full Marathon. The never-competed-on courses feature incredible scenic views throughout a dozen neighborhoods including the Downtown, North Shore and St. Elmo areas. Throughout the weekend, people can enjoy live music and entertainment, technological innovation and health & wellness initiatives that celebrate an active lifestyle within our community. “We are delighted to be associated with this event particularly with Erlanger’s longstanding role in providing first-class emergency medical services for major athletic events in this community. 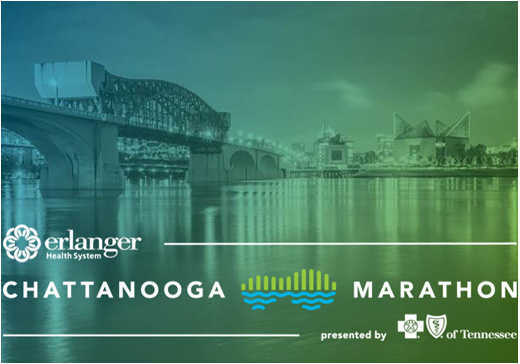 As one of the region’s leaders in technological innovation, health and wellness initiatives, this partnership was a perfect fit and we look forward to a record turnout for the 2016 Erlanger Chattanooga Marathon,” said Kevin M. Spiegel, FACHE, President and CEO of the Erlanger Health System. This event was strategically placed in the spring to maximize local participation and to drive visitors to Hamilton County. “The Chattanooga Marathon is much more than a race. The race and the events surrounding it are a celebration of healthy living, which we are proud to support as presenting sponsor,” said Dawn Abel, Director of Community Relations for BlueCross. For information on sponsorships, registration, routes, and volunteer opportunities, visit us online. The Chattanooga Marathon Planning Committee is a collaborative community effort between the City of Chattanooga, Hamilton County, Chattanooga Convention & Visitors Bureau, Chattanooga Sports Committee, Chattanooga Track Club, Finley Stadium, University of Tennessee Chattanooga, Outdoor Chattanooga, Chattanooga Chamber of Commerce, and the Classic 150. All organizations are working together with one common vision to successfully produce this not-for-profit community event.